Don't let being 50 hold you back from starting an exercise program. You don't have to join a gym or invest in a lot of expensive equipment. The best exercise program for a 50-year-old woman is a well-rounded one. Start small and start slow, but make sure you incorporate resistance training, cardiovascular activity, stretching, core and balance training. This will set you up nicely as you age and perhaps reveal a you that you've always longed to be: Strong, toned and healthier. 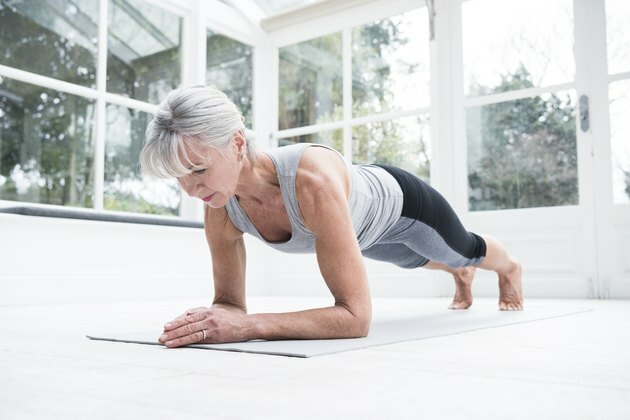 In your workout for a 50-year-old woman, it is imperative to incorporate resistance exercises into your weekly routine to prevent muscle loss and keep your strength up. Incorporate exercises that utilize all the major muscle groups of your body, which include chest, back, shoulders, biceps, triceps, quadriceps, glutes, hamstrings and abs. Choose a weight that will fatigue your muscles in about 10 to 12 repetitions in two to three sets. Cardiovascular exercise keeps your heart healthy by lowering blood pressure and cholesterol, helps prevent diabetes and weight gain, and improves your quality of life through increased stamina and endurance. Appropriate modes of exercise include treadmill, stationary cycle, elliptical, stair machine or any other activity that actively elevates your heart rate such as dancing or hiking. Aim for an intensity that increases breathing and feels challenging, but you're still able to speak or have a short conversation, or about 65 to 75 percent of your maximum heart rate. If you are accustomed to exercise, challenge yourself with shorter bouts of more intense exercise. Training your core will help maintain your posture and balance, as well as keep your midsection tight and toned. Target the deep abdominal muscles of the transverse abdominis and internal obliques with planks and side planks. In an ABC News online article, Michele Olson, Ph.D., professor of exercise science at Auburn University in Alabama, recommends stability ball rollouts, where you kneel on the floor and place your elbows on a ball. Allow the ball to roll forward while opening your hips and shoulders. Then, contract your abs to pull the ball back toward you. Pelvic tilts, abdominal pulses and yoga are also ideal activities for training your core. Stretching is a must-do exercise for a 50-year-old female. It's often an understated aspect of fitness, but adequate flexibility allows you to have greater range of motion, freedom of movement and relaxed muscles. Stretching corrects imbalances, decreases soreness, reduces risk of injury and improves posture. Before engaging in static stretching, do about five minutes of movement to warm-up the muscles, which can include walking, cycling, or just large dynamic joint movements like arm circles and trunk rotations. The American Council on Exercise suggests stretching each major muscle group and holding each stretch for 15 to 30 seconds. Do not bounce, strain, or hold your breath. Train each major muscle group at least twice per week on non-consecutive days. Do either two days of total body, or three days intermixing upper and lower body. After weight training, sit and stretch your muscles. Aim for 30 minutes of flexibility training three days per week; however, even five minutes will elicit benefits. On non-weight-training days, work on your core, balance and posture. Engage in moderate amounts of cardiovascular exercise most days per week. The American College of Sports Medicine recommends a minimum 150 minutes per week of activity. If you are new to exercise, break this down into 10 to 15 increments one to three times per day. American College of Sports Medicine: Is Middle Age Too Old to Start Exercising and Seeing Benefits? Research Shows That It's Not Too Late!